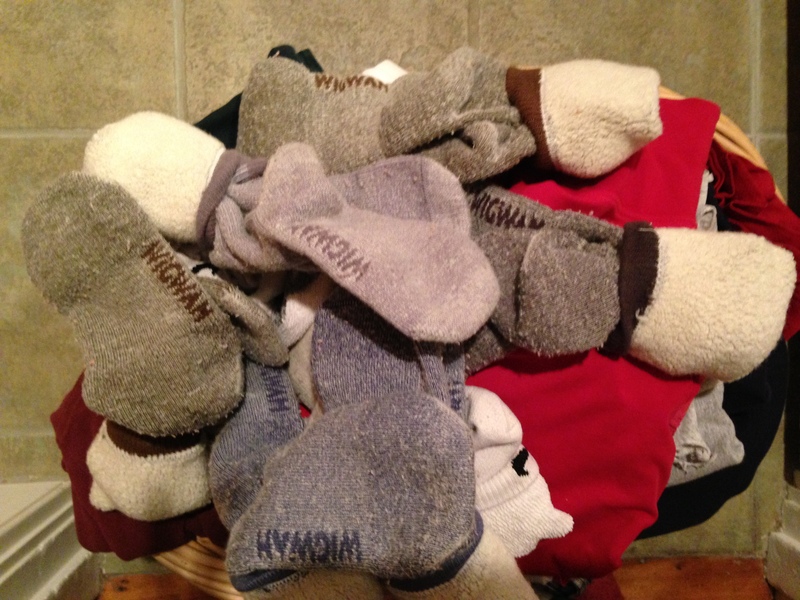 In case you don’t know what Wigwams are: they’re among the best winter socks you can wear in Maine. Not that we’re experts in winter socks – I’m sure our education will continue this year – but we do know we’re not the only ones here to like Wigwams. After we discovered them last winter – at Reny’s, of course, our local/ neighborhood/ state department store (Buy 3 pairs, get one free) – we barely wore any other socks all winter. Except at the gym – although we could’ve stuck to Wigwams even there, had we known they make gym socks too. The point is – if you wear Wigwams, your feet won’t have any complaints all winter. The rest of you will probably still shiver, unless you have equally miraculous thermal underwear (Wigwam doesn’t make any – I checked), but your feet will be safe. And in the warmer seasons you might actually miss them occasionally, when glimpsing them in the nether regions of your sock drawer; in which case you may sigh and say to yourself, oh well, it won’t be long until I get to wear these again. Even if you hate and dread winter, you’ll take comfort in the fact that, should it come around again, you’ll have your wigwams to help you get through it. Or you might discover, as I did, that you really don’t have to be without your Wigwams for half of the year. You could just swim outdoors, from June to October, and I guarantee you’ll eventually, and automatically, reach for them again. Unless of course you swim only in heated pools and on hot days – in which case you’re probably not really up for Maine swimming anyway. 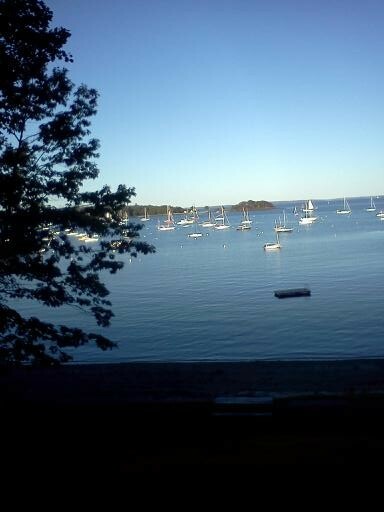 1) At the beginning of the season: You can’t blame a pool woman for itching to swim once June has arrived and everything looks like summer (in Jersey, we used to open our pool in the end of April).This being Maine, I knew I had to start with a lake or pool, and I did. But one of my goals this summer was to find someplace convenient – close by, not too crowded, and swimmable (meaning, I’d actually be able to swim in it for a while, without jelly fish, high waves, lack of space, or freezing temps). Laite Memorial Beach here in Camden fulfilled the first three requirements, and I kept hoping the fourth would follow eventually. It’s the closest swimming hole to our place unless you count the two hotel / motel pools close by (no, I won’t mention names – sorry! J) – a nice ten-fifteen minute walk or 3 minute drive away. 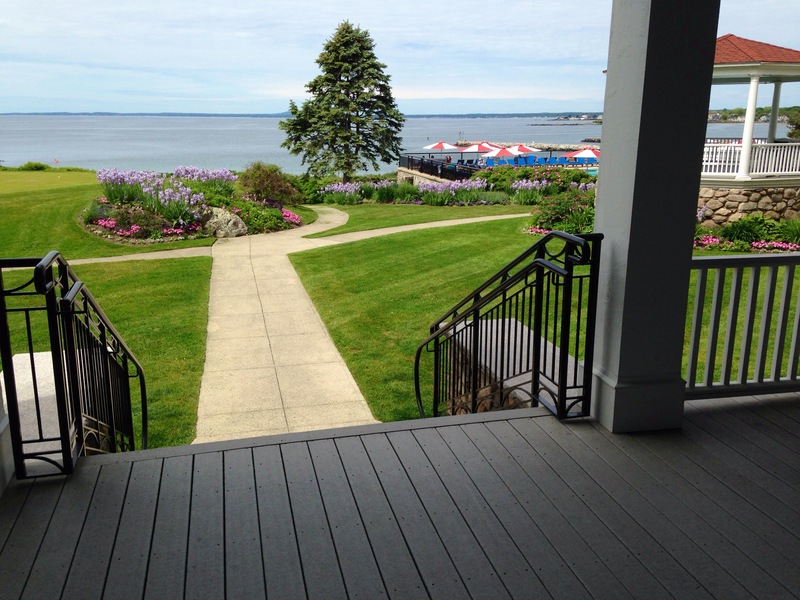 Not to mention it’s beautiful – adjacent to a nice park with Frisbee-catching dogs, in a beautiful neighborhood, with amazing views ,and, while it’s small as beaches go, it offers a lot of typical beach pleasures, minus crowds and fees and vendors, and plus a scenic view of windjammers sailing in and out of the harbor. Anyway – I had high hopes for my first Laite Beach swim of the season last year, towards the end of June. It had been a late 70s day, and we’d had a few other warm weeks – clearly, I’d given the water enough time to crank up some heat. Or so I hoped. At that time of year, generally called “summer,” when you walk into the ocean in a temperate climate like the Jersey Shore or most of the West coast, you get used to the water body part by body part. Your feet aren’t usually cold for more than the first ten seconds, and the same goes for your knees. Once the water comes up to your stomach, your legs are ok – and so on. At Laite Beach, especially at low or medium tide, it takes a while to walk out to a swimmable water depth. And it takes even longer for any one body part to get used to the temps. By the time my stomach got wet, my feet still felt weird and tingly. Must be a little crab sting, I decided, and ignored it. That worked for a while, considering the increasing number of other cold body parts I could focus on instead. Breathing into it and pretending it was a hundred degrees and I had just moved back to Vegas helped a little, and eventually I got myself all the way in, and swam for about ten minutes. Well, no – maybe just five. But it seemed like fifteen; it even seemed like I’d exercised. Under extreme temperatures, hot or cold, you always feel like you did a lot more than you actually did. When I got out, it was hard to walk. What had happened to my feet? They were numb and tingling at the same time, and … hmm, did I still have feet? I looked down. Yup, there they were, looking vaguely familiar, but they sure didn’t feel like my feet. I changed into a dry suit and made sure plenty of sun made contact with my feet. No, not good enough. It all just felt strange – definitely not harmless and normal enough to stay and relax, much less go for another swim. Best to walk back fast and then soak them in hot water or something. Rats – so much for my beachy, relaxing afternoon break. After about a block, I called Siobhan. Help! I can’t feel my feet! I need a ride! Maybe even to the emergency room! She was there in a flash – “be right back” sign slapped to the door, Mini zipping around the corner ready for rescue. But – after a quick assessment of feet and mental state – she wasn’t up for sacrificing check-in time for an ER visit. Oh well – it’s not like I love to hang out in ERs, certainly not on a Saturday night. A shower and a few talks with guests turned out to be the only treatment I needed. But the point is: that’s how I ended up wearing Wigwam wool socks for two hours after a long hot shower, on a warm summer evening. With shorts. 2) For our last overnight getaway last season, in the middle of October, we contemplated Monhegan Island (but the Island Inn had only rooms with shared bathrooms left), Moosehead Lake (but moose safaris had just ended because the hunting season was beginning), and the Colony Hotel in Kennebunkport, an old favorite. The Colony has a huge heated (not just heated, almost hot!) saltwater outdoor pool, which is open as long as the Colony is, come hell or high water, snow or low temps. On the 19th of October, it was 40 something degrees, grey, and a bit foggy, and for some now unremembered reason we didn’t get to the hotel until late afternoon. 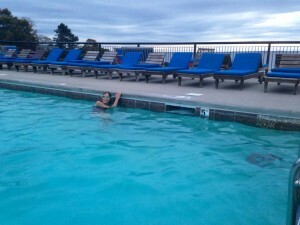 So by the time I made it to the pool, it was dusk. I had to plan carefully to minimize cold exposure, so on the way from our room to the pool I wore sweatpants, T-shirt, and hoodie over my bathing suit, plus the long fluffy winter bathrobe I’d packed for the trip. Steam was coming off the surface of the water; barely visible within it was one other woman, a fellow end of season swimmer I met again the next morning. I chose a chair very close to the shallow end of the pool – force of habit; there was really neither a need nor a desire to enter the water slowly and gradually. Aah, what a contrast to my other swims this season! I never swam in water twice as warm as the air. There is nothing like that combo to guarantee a good long workout – a bit like a hot shower during a power outage (in the kind of house where you still have hot water, but not enough heat): you wanna stay in there for as long as you can. – Eventually, of course, you probably have to go to the bathroom, or remember you have a dinner date, or wherever you’re swimming is closing for the day. You make a cold-and-wet-minimization plan, and put it into action as quickly and efficiently as possible. In my case, that involved 1) stand on towel, put on slippers 2) towel off, put on robe, 3) dash inside to the pool bar bathroom to change – all in fifteen seconds. – And then, after putting my sweats, thermals, and hoodie back on – here they came again, packed as a special post-swim treat: the Wigwams. What more could I need? Well, maybe a stop by the fire up in the lounge, where Siobhan was waiting with a warm-up drink, followed by a hot shower and a nice take-out dinner – in pajamas and Wigwams, of course. There’s no better way to say good bye to the swim season and hello to the colder half of the year…. P.S. I wish I could say I participated in the Lincolnville Polar Bear plunge, after which I would most certainly have needed a double portion of Wigwams. But even if I had been in town to do so, I probably wouldn’t have lived to tell about it. If you know anyone that did, ask them what they – and their feet – wore for days and nights afterwards. This entry was posted on Wednesday, February 4th, 2015 at 3:49 am and is filed under swimming in Maine. You can follow any responses to this entry through the RSS 2.0 feed. Both comments and pings are currently closed.